I was recently enjoying reminiscing with friends and former England team-mates, Chris Ogborne, Simon Kidd and Stuart Crofts, about campaigns we shared. The conversations converged on recent England team performances, not in the context of the parochial home internationals, which mean little in terms of international standing, but the rigour and spotlight of the FIPS-Mouche World and European championships. In spite of having an immensely talented pool of anglers, Team England (fly fishing) has performed dismally in recent years. In the 1990s we were unquestionably in the top three, while this has gradually slipped to the parlous results of today, when we barely hold a top ten position in FIPS events. Had it not been for the silver medal in the Euros of 2007 in Norway and the world championship win on the essentially ‘home’ waters of Scotland in 2008 we would not rank even this highly. So, just what has gone wrong? There are those who will suggest it is no more than a bad run of luck. But this is nonsense. Some will blame the anglers selected, but this too is wrong. I know most of those competitors, and frankly one should be in awe of their abilities: Iain Barr’s stunning competitive abilities on still waters, Howard Croston’s simply exquisite casting prowess, John Tysack’s almost other-worldly abilities on the river… I could describe a very long list; make no mistake there is genius there, and it runs as deep in English fly fishing as it does among the manifestly great, FIPS-dominant Europeans, such as the Czechs and the French. There has been never-ending controversy about the selection process and I think it should not be denied that England has one of the weakest in an international sense. We choose teams from a very shallow range of qualifiers and national finals and then choose the FIPS teams from those squads, which includes the loch-style team. The latter forms a very poor basis on which to select a truly world-class team. There are currently 28 members of these teams each year, plus reserves, qualifying from a very small pool of competitive loch-style anglers. Also, loch-style is the least important discipline in FIPS championships, where rivers dominate. Add to this that the loch-style teams are selected entirely from competitions on artificial, stocked waters, and we do not need to wonder why the final teams perform so poorly on wild waters. Quite apart from the selection, however, is the preparation process; essentially coaching. This is almost non-existent in the ‘senior’ England teams. Look at any other sport, at international level, and one finds coaching as a given in terms of development. It is crucial. All the great international fly fishing teams of today have a programme of coaching, geared towards particular championships, sometimes several years in advance. One had hoped, when the ATr took on the role of administering the international fishing teams that coaching would have taken a central role, but in fly fishing, beyond some TEFF managers going through the process of taking a formal ‘coaching’ qualification, this has not been the case. However, there is a lot the individual can do to help himself, and, in consequence, his team. It has been a weakness of England teams that competitors in practice have historically chosen their water and sought to catch the maximum number of fish from that water. I used to do this myself, relentlessly. It is not clever, and as part of one’s development it means very little indeed. I still do it every now and then. 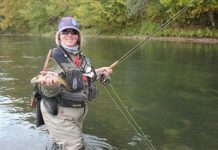 Four times last year – once in Slovenia, once in Czech and twice on the San – I found myself on water where a 100 plus catch was possible, and I was not able to tear myself from the river until I had achieved this. On one day on the San it needed Wojtek to almost drag me off ‘El Dorado’ where I had found an immense shoal of trout. The point is that occasions like this do absolutely nothing to develop the fly fisher; the competitor. It is always better to leave such water and to go in search of challenge. In a FIPS, on the river, the competitor cannot choose his water. One draws a series of sections and simply has to make the most of those. 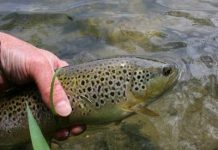 They have the range of the wild river; from ‘blank saving’ torrents to areas as in the above example on the San where trout or grayling might be concentrated. Most usually they are something in between, for the majority of the field, and it is on such water that champions may be made. Everyone, at this level, can fish the easy, ‘percentage’ water, as above. 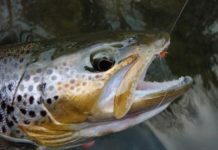 Very, very few can successfully, consistently take on those sections which have low fish populations, or which have been heavily fished, such that the fish are extremely wary. So, my top tip to those I coach is always to stop fishing the percentage water. Forget about the numbers game and learn how to fish the most challenging water in the river. Every river has this, and you owe it to your own competitiveness, and your team, to make the most of this water. I remember once telling my team manager, Paul Page, that I felt it would not have been possible to fish a particular session any better than I had in fact done. I knew, even at the time, that this was nonsense. I remember that I caught one rainbow and one grayling from this section, which had at least saved the blank, but I had lost a good grayling and concentrated too long on some undersized trout; I had made a bad mistake with the timing, or pace, through the considerable amount of water on the beat, and I had probably lost time in a mild ‘panic’ phase when I knew that I was in the wrong position. Nowadays, on that particular section of river (in similar conditions) I would realistically expect four or five, perhaps even more, before I would be satisfied with a three hour session. Look at it like this: if one is lucky enough to draw those magical sections which have the potential for, say, 50 fish in a session, and one under-performs and catches perhaps 40, you are still going to be in the top three with such a result. At this level, nowadays, everyone can do this, so nothing really proved there. If you draw the other end of the spectrum and under-perform such that you blank, the result is catastrophic, whereas if you manage to save the blank, or even manage two or three, this can put you in the mid-order and have an overwhelming beneficial result on both individual performance (over all the sessions) and that of the team. 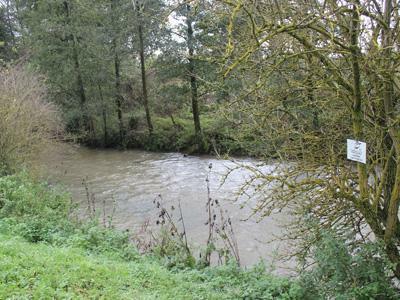 The accompanying images show la Ternoise in northern France; it is fining down after heavy rain, and clearing quickly because it is a chalk stream. It is very challenging in a variety of ways from casting and the overall approach, for wild fish, to presentation on rapidly changing water. Top French internationals fish this sort of water and hone their great skills here. If you are interested in fishing any of the European rivers or areas discussed in this series, please have a look at my website Presentation Fly Fishing I take only a few groups nowadays, concentrating on the outstanding and challenging chalk streams of the Artois region of northern France, but I can certainly point you in the right direction. If you are interested in fishing on the San, in the Czech Republic or Slovenia, I strongly recommend you get in touch with Wojtek Gibinski who runs the excellent Polishquills business, which has a beautiful lodge right on the banks of the San.